« Curious about where the Trolley goes in Birmingham? The contest, Prize 2 the Future, is all about cool ideas to transform Birmingham! And over 1,000 have been received. So we’ve been thinking – what makes a good idea better? Well, most often when it becomes a reality or when it stimulates another good idea! So ultimately every idea has to be shared to create value. This is one of Bob Moody’s favorites quotes (not sure where it came from!). It just means to him that good ideas are followed by massive amounts of work! Yes, ideas are cheap and mostly free for the taking by those who are willing to risk all their energy and resources to make them happen, and consistently refute obstacles along the way. Often a good idea develops from one that never happened, or maybe a better one is sparked by the ideas of others. Over the years, Bob has had LOTS of ideas for Five Points South and has spent LOTS of hours trying to sell them. Some are still valid, and maybe it’s better that some were never financed. Nevertheless, there are lessons to be learned from all of them. It’s followed by one where something NEEDS to happen – but hasn’t happened yet! It’s known as Pickwick Place, and because retailers are hidden behind The Highland Hotel, some excitement needs to be created which will draw them into the interior spaces. 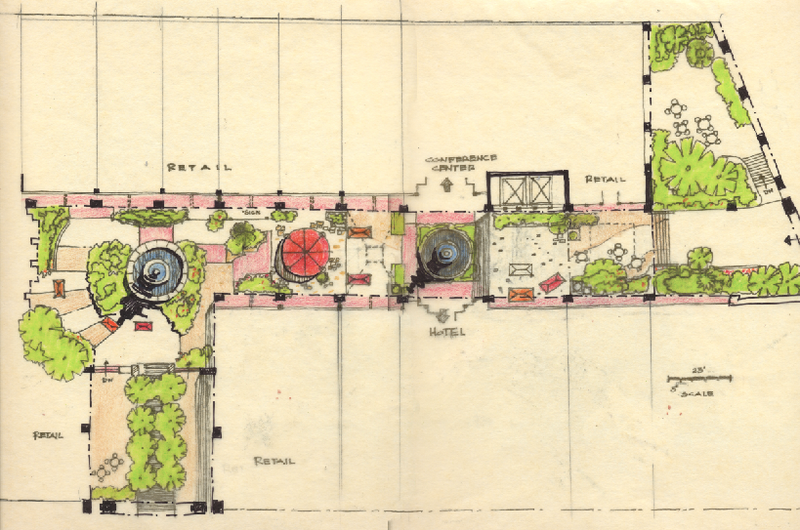 Bob created a few sketches with landscaping and ‘eyewash’ to try to help stimulate investment and subsequently attract retailers. 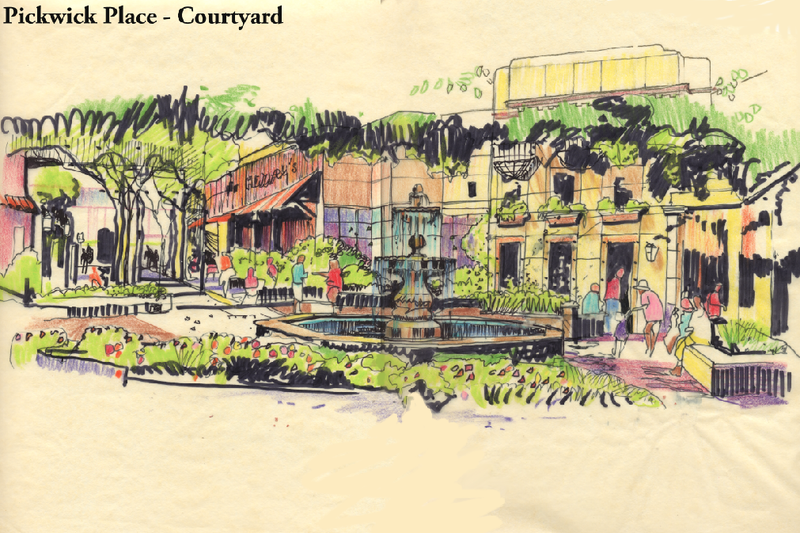 This entry was posted on Friday, April 1st, 2011 at 7:33 pm	and is filed under Architectural Renderings, Birmingham Information, Birmingham Paintings. You can follow any responses to this entry through the RSS 2.0 feed. You can leave a response, or trackback from your own site. Fantastic! Thank you so much for putting these online. 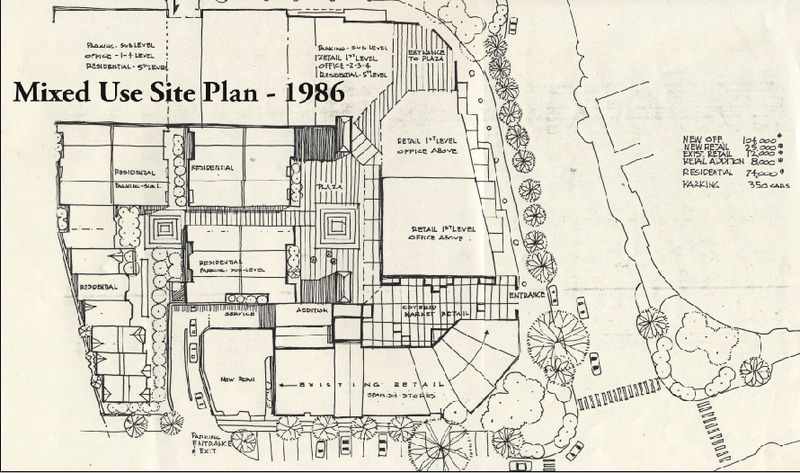 How I remember beautiful Five Points South and the wonderful projects the Moodys were involved in. Always making difference. These are great.